Please visit our Suzuki Music Store to view our current selection. Suzuki, the world's most respected name in music education, has developed this collection of quality guitars to provide you with just the right instrument to make your music exceed your expectations. Suzuki guitars combine hand selected natural materials with precision manufacturing efficiency and experienced hand craftsmanship. This combination creates the extraordinary line of acoustic and electric guitars you are about to discover. 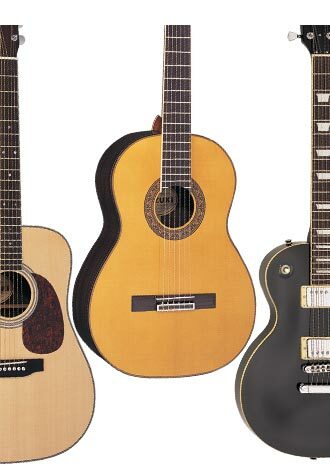 To accommodate your individual playing style, Suzuki offers you exceptional quality and value in Student, Classical, Dreadnought, Electric and USB Electric guitars in several sizes and styles. As the world's largest manufacturer of musical instruments for education, Suzuki is able to offer you the precise construction, high quality hardware, unique features, fine finishes and attention to detail not found on guitars costing much more. Selecting the right guitar is like choosing a good friend; both will be part of your life for years to come. Give all the Suzuki guitars a try and discover the good friend a new Suzuki guitar will become. There's one that's just right for you.